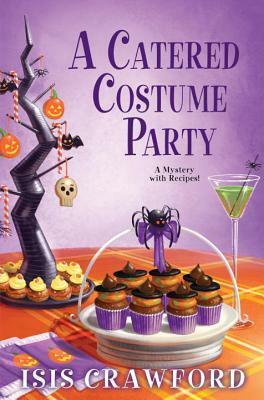 A CATERED COSTUME PARTY BY ISIS CRAWFORD *Release Date 8/29* – Books, Books and More Books! When sisters Bernie and Libby Simmons agree to cater an extravagant Halloween party in their little upstate New York town of Longely, they figured a ghost or two and a blood curdling scream might be part of the menu, but they never expected to be haunted by the deadly specter of murder . . .
Halloween is coming, and Darius Witherspoon isn ‘t giving up on his plan for a catered costume party despite the recent disappearance of his wife, Penelope. He may be heartbroken, but perhaps throwing a big shindig in her honor will boost his spirits. He s going to hold it at his stylish new co-op apartment at the Berkshire Arms, where the couple had dreamed of moving in. Darius hires Bernie and Libby to provide the treats. They d prefer to avoid the festivities altogether. As far as they are concerned, the Berkshire Arms is a haunted house or at least haunted by the memory of the murder that happened on the site, when it used to be The Peabody School. But as always, there are bills to be paid, so they accept the job. And in the midst of the celebration, Darius is discovered hanging from a noose outside one of the ballroom s French doors . . .
Was it suicide, induced by despair over his missing spouse? Bernie and Libby think not, once they read the note he left which includes a sum of money and a request for them to do something if anything should happen to him. Now, once the serving trays have been cleared and the decorations taken down, it s time for the sisters to unmask a killer . . . I do love a good cosy mystery that is centered on food, this one was rather disappointing. The sisters spend most of the book bickering about everything and it just did not come off as believable. In the beginning they are worried about business but instead of getting down to business, they don’t seem to care that much about it. A few really good desserts were mentioned in the book, but the recipes had nothing to do with any of those dishes. For me this was a no. September is giving us some seriously good books! Here are just a few! Aw that stinks. I like the premise.